In the shower this morning, I thought about whether the long-ago people who invented and told myths actually believed that the moon was the sun’s wife and that a dyspeptic giant caused earthquakes. It’s possible people some people didn’t believe the stories, even back then. Maybe some of them took an atheistic or agnostic stance and regarded those old stories as a method of putting the world in a context that people could deal with. Could anyone have been that clever back then? Maybe some math-minded person who saw the world as its bare components instead of imagining a face on everything, Super Mario Bros.-style? In fact, I’d be shocked if the ancient world didn’t have a few pessimists walking around, imagining they lived in less of the fairyland that everyone perceived. But how lonely it must have been for them — having no one with whom to discuss the fact that dueling gods in heaven were not, in fact, responsible for a recent spate of bad luck, not to mentioned that they wouldn’t envision a spirit inhabiting every rock and tree. They’d be alone. Not only would their view of the world put them in a minority, but they’d know that humans, as a race, were flying solo. Then, after showering, I began putting on sunscreen. I burn easily, so I put on sunscreen everyday. But today, mid-application, I stopped, because the whole of me was consumed with the realization that I have a personal relationship with the sun. The sun — a giant ball of fire that has burned for the entirety of existence as I can perceive it. Dinosaurs saw it, Cleopatra saw it, my great-great-grandparents (none of whom I was able to meet) saw it, and it will be hanging in the sky eons after you and I aren’t here anymore. The sun — a deep-space chemical fire so massive that it could fit a million Earths inside in, and which I notice every day but I can’t even look at directly, because it’s powerful to the point that it’s harmful to perceive it, to say nothing of attempting to get much closer to it than we currently are. The sun — a celestial body that, almighty though it may seem, is merely one of many stars also pulsating with unimaginable energy throughout the galaxy, heating up space and making existence happen. Because of this entity, which I’ve read about in books and which I am unable to not notice during every daylight hour, I have to pay Rite-Aid a few bucks in order to purchase goop that I put on myself to prevent my skin from revolting against me and causing me to die early. The sun is the source of all energy. The sun could kill me and not think twice about it. I have to buy goop. I live on Earth, close-ish to the sun, relatively speaking. It is perhaps preferable to imagine instead that the sun is a magical man driving a shiny chariot across the sky every day. I am a total pagan about the Moon. I was looking at the Moon the other night and thinking about how beautiful it is, and I realized that I would take a pledge made to the Moon with much greater gravity than I would a pledge in the name of God. I wonder why the Mario games never had an Angry Moon. Or is it because Majora's Mask stole the idea? 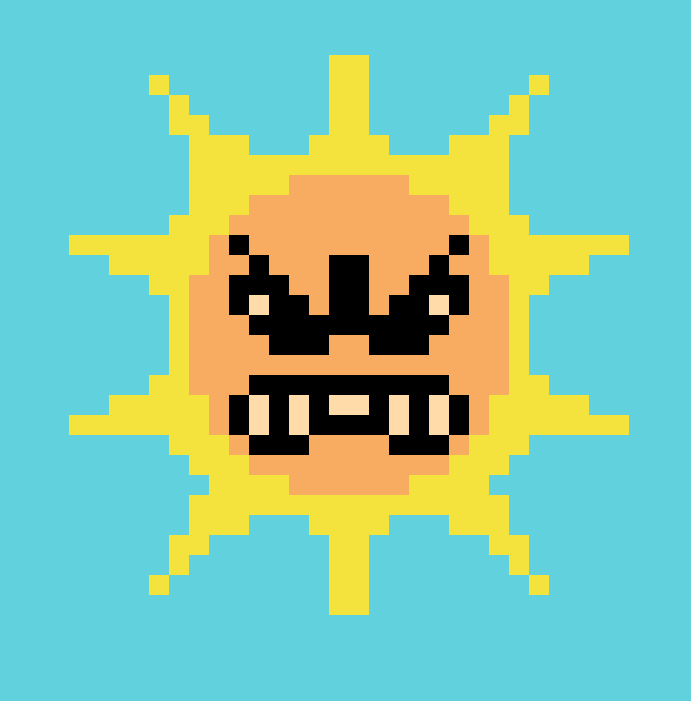 Ideally, the angry moon would have come out after you killed the angry sun, no? That would certainly make that desert level more challenging.